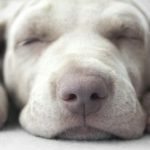 Understand dog sleep is key to keeping your pup happy and healthy. Most sleep an average of 12 to 14 hours per day. Puppies and old dogs can sleep up to 20 hours per day. Sleep behavior: Most dogs adjust their sleep patterns to spend more time with their owners. Unlike humans, your faithful friend sleeps in bursts throughout the day. Dogs typically experience sleep-wake cycles of 16 minutes asleep, 5 minutes awake. 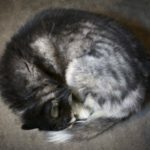 Understand sleep positions: Wonder about why dogs tend to sleep curled up? 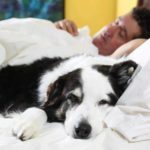 Sleep positions reveal information about the dog’s personality. For example, nervous dogs will sleep curled up. Confident dogs will rest on their backs. Help your dog get a good night’s sleep: Puppies, overweight dogs, and senior dogs all can struggle to sleep all night. But you can take steps to help them get enough rest. 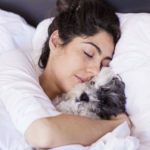 Dog sleep safety: If you sleep with your pup, practice dog sleep safety. Make sure your dog’s paws are clean, watch for fleas and ticks and give your dog enough space. 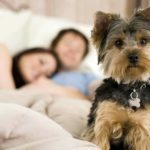 Should you sleep with your dog? 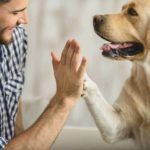 Science says sleep with your dog to get a better night’s sleep, reduce stress, improve your heart, lower your blood pressure, reduce pain, boost emotional health and reduce the risk of allergies. 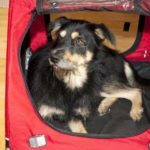 To make sure your dog gets enough rest, consider whether sleeping with you is restful for him. Your dog might be happier sleeping in his bed if you snore or are a restless sleeper. 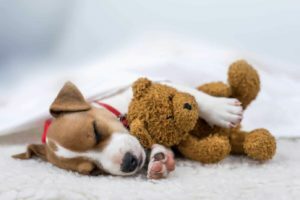 Dog sleep behavior: Although dogs need up to 20 hours of sleep per day, most dogs will adjust their sleep patterns to spend more time with their owners. Canine comforts. Pick a spot for your dog to sleep. Most dogs will go where you tell them if you establish dominance over the house first. 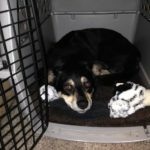 If you sleep with your pup, practice dog sleep safety. 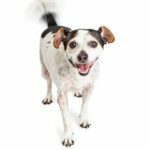 Make sure your dog’s paws are clean, watch for fleas and ticks and give your dog enough space. 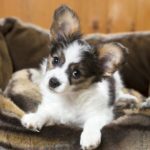 Buying a dog bed for your pup offers benefits including better sleep, reduced injury risk, greater warmth and peace of mind. Curling up — the most common dog sleep position — provides the greatest security. Dogs curl with paws underneath and tail wrapped around the face. The most common cause of canine insomnia is pent-up energy. Help your dog sleep through the night by making sure she gets plenty of exercise. Sleeping with dogs is part of our DNA. According to evolutionary psychologists, since humans domesticated canines, we have been sleeping with dogs.